The Danbury Council of Pastors (CONPAS) gathered in the morning of January 17 with local business owners to pray for the city’s prosperity and, therefore, to plant the seed of unity among business entrepreneurs in Danbury. The meeting was held at the Assembly of God Church, with the attendance of many local and regional religious leaders. Pr. Silvani DaSilva, CONPAS president, took the initiative to foster interaction among attendees and emphasize the importance of the event. 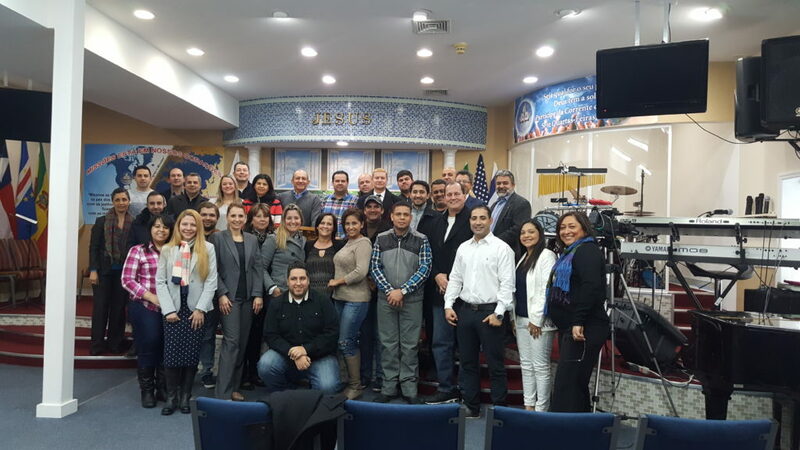 “The idea of this meeting flourished when we identified the need to unite our fellow Brazilians who are business owners in the Danbury and neighboring towns to pray. Our goal is to pray together for the city of Danbury because we believe if the city prospers we will also prosper. Prayer has magnificent power in the presence of God,” he explained. Pr. DaSilva believes that the meeting fostered interaction among old acquaintances and provided an opportunity for participants to meet other individuals who are starting new businesses in Danbury. For Sergio Castro, owner of Castro’s Auto Detailing & Window Tinting in Danbury, the meeting was very positive and most needed for local business owners. CONPAS intends to make the business owners gathering more frequent and transform the attendees into a strong and unified group, said Pr. DaSilva.